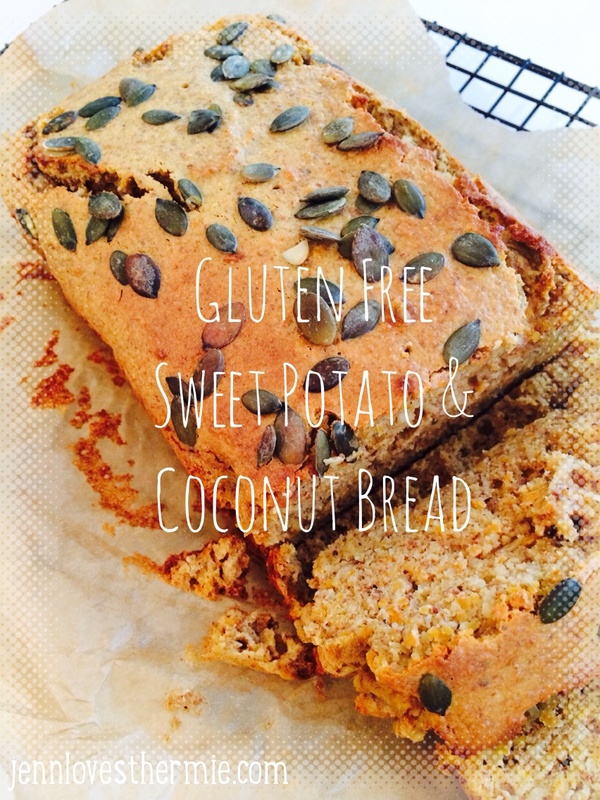 Gluten Free Sweet Potato & Coconut Bread – Jenn Loves Thermie! I came across this recipe from a great blog called The Nutrition Guru and the Chef and happened to have enough of all the ingredients in the cupboard to give it a go and I’m so glad I did. This will become a new staple ‘treat’ in our house. I say ‘treat’ because my boys love cake but they also don’t do well on loads of sugar so I’m always trying to find alternatives that are good for them but also have that element of ‘treat’ factor! This is definitely it. I also expect that this will become my new school bake sale favourite as well! Preheat over to 180 degrees, grease and line a loaf tin. Add the almonds to the TM bowl and chop for 10 Sec/Speed 10. Set aside for later. This will become the flour for the bread. Add the sweet potato to the TM bowl and chop for 15 Sec/Speed 6. Set aside for later. Add the eggs into the TM bowl and then insert the butterfly whisk. Whisk for 10 Sec/Speed 3. Remove the butterfly whisk and add all the remaining ingredients to the TM Bowl and mix 45 Sec/Reverse/Speed 5-6. Scrap down the sides and mix for a further 5 seconds. Pour mixture into the greased and lined loaf tin. Optional – you may wish to sprinkle with crushed nuts or seeds such as pumpkin or sesame to decorate. Bake for 30-40 mins, until brown and a skewer inserted into the middle comes out clean. This would be great for mini muffins or regular muffins as a great snack size for lunch boxes – just reduce the cooking time.